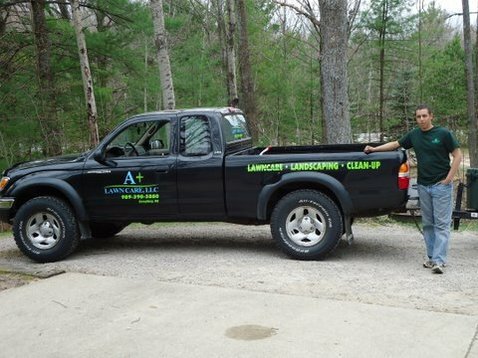 A+ Lawn Care is an experienced provider for residential and commercial customers. We are your trusted experts in lawn care, landscaping, sprinklers, snow removal, ice management and hold a reputation as a leader in quality, service, experience and value. We currently serve Crawford, Roscommon and Otsego County. Grayling, Gaylord and Higgins Lake Michigan is our main area of operation but we are willing to schedule you in if you are not in these areas. Our pledge is total quality, assurance and complete customer satisfaction. Mowing, landscaping and sprinkler system maintenance are some of the common services we provide. If you are new to our site feel free to look at our services offered. We offer FREE ESTIMATES with no obligations. Feel free to contact us with any of your questions about our service plans or your concerns. If you decide to allow us to come and give you a free estimate take a minute before hand and look at some of the photos from our current and previous customers. This may help to generate some ideas of what else you may be interested in.